Overnight, we got about 4 inches of wet snow. It's borderline slush actually, the kind that is going to produce snowballs but will also make you really wet when playing in it. My task this morning was finish shopping. I had one framing project to drop off, one stop at The Bookstore in downtown Glen Ellyn and a swing through Whole Foods for fresh fruits and veggies. Four-wheel drive into the street and we're off. It is beautiful out. This kind of snow sticks to everything and makes things look frosting covered. Walking about with a tiny camera means I can keep it drier than if I had a large one like Carole and David have. 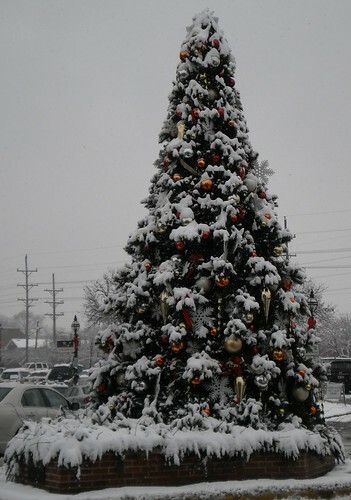 Of course, I'm limited in my shots to what the camera can do, but, as this photo of the tree in downtown Glen Ellyn shows, it takes perfectly wonderful photos on its own. The forecast for tomorrow is partly cloudy. It might be a time to wander parks for good photo opportunities. There are too many people scared to be out in this actually out driving in this when they should be at home for me to feel comfortable driving about now. I'm home. I got 90% of what I needed to get done, done. This kind of snow makes the upcoming season more real for me. HO x 3!